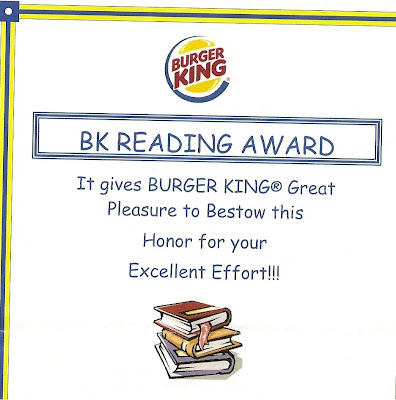 Weighty Matters: Burger King has a "Reading Club" for 6 year olds? 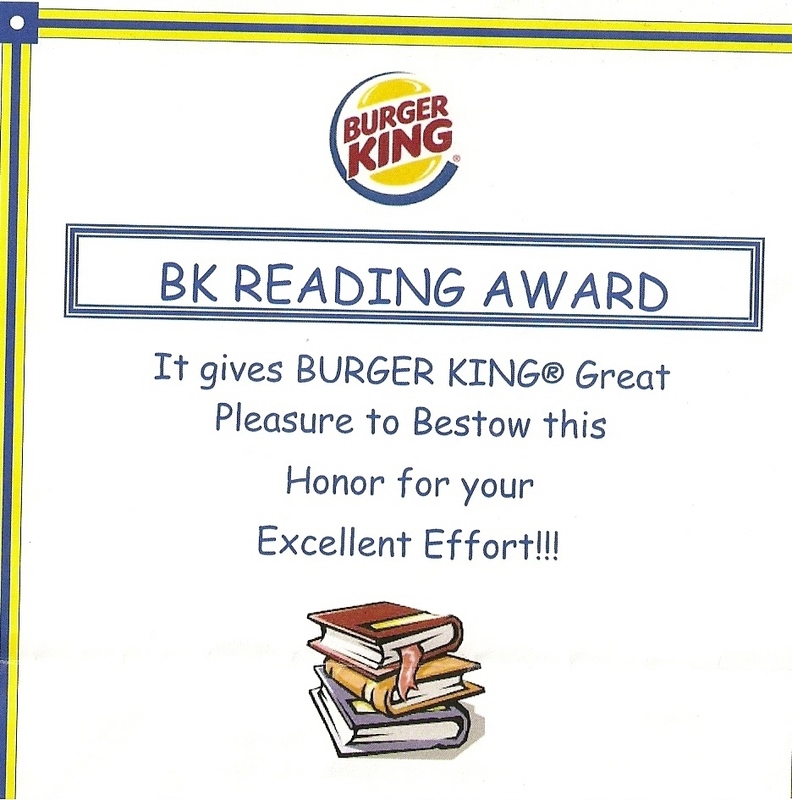 A reader of mine from Smiths Falls (Upper Canada District School board) who wishes to remain anonymous forwarded me a scan of her 6 year old daughter's Burger King reading award. Her award? Free French fries. A quick google search later and voila, while I couldn't find it on a formal Burger King Website, I did find it detailed on a South Dakotan school's website - the Burger King Reading Club. So what's in it for Burger King? 1. Little children who'll associate Burger King with happiness, pride and winning. 2. Meals likely purchased for entire families who may well have otherwise not gone to BK. 3. A program they could theoretically brag about in their annual report, or leverage in arguments against policies like fast food outlet zoning around schools, in terms of their corporate social responsibility. "What bothers me is that it came from BK. Not Chapters, not even Toys R Us but BK. A fast-food joint. It's not like my kids don't get treats but there are far too many treats handed out at school and activities." Worse still, I'm betting that BK doesn't even pay the school to have the program, but rather that the program was pitched to the school who adopted it voluntarily thinking it's a wonderful way to encourage kids to read. Whether it's pizza day, ice-cream sandwich day, Burger King Reading Clubs, McDonald's school bus safety day, McDonald's report cards, etc. - schools need to get out of the business of promoting and selling fast food. Schools should safe havens for our children. Fast food has no place in our schools, and I think programs like this one, and the ones I mention up above, are best described as well intentioned, but woefully misguided, dietary bullying.